Brilliant image by Dave Kendall. Reputation management agencies. Super-injunctions. D notices. Damage limitation exercises by mainstream media. Complete suppression of the truth by MSM. Only reveal the truth when they’re dead. Decoys and scapegoats. Find vulnerable or flawed witnesses to reveal truth and then discredit them. Discredit investigators, official or otherwise. Enquiries that go nowhere or are damage limitation exercises or reveal the truth so much later it attracts less public interest. They have a whole armoury of such techniques and doubtless many more. The information about Savile and others was widely available on the web long before it was ‘revealed’ in the MSM; which means all the MSM have zero credibility in this . It will be instructive to see what techniques are used this time to handle the crisis. The only thing you can be sure of is the whole truth will never come out. 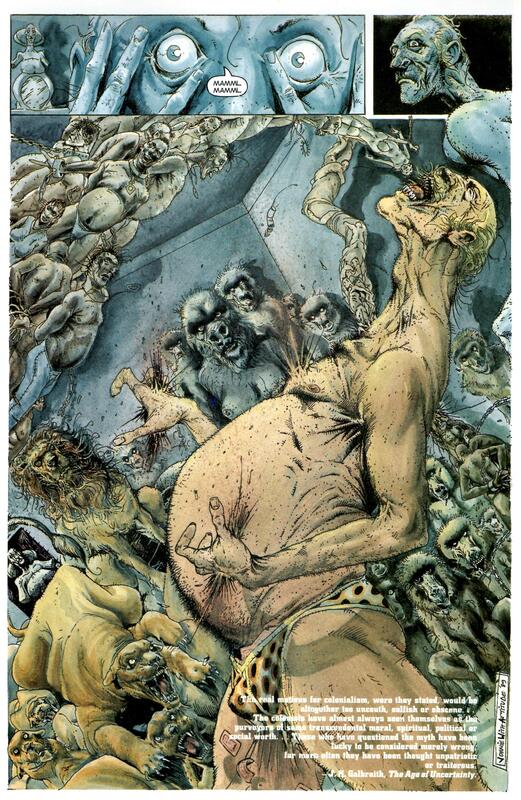 In particular, the thinking of the elite which – as with clerical abusers – includes a coherent and intellectual defence of the indefensible and a very real form of ‘droit du seigneur’. When words can’t say it all, a picture can. 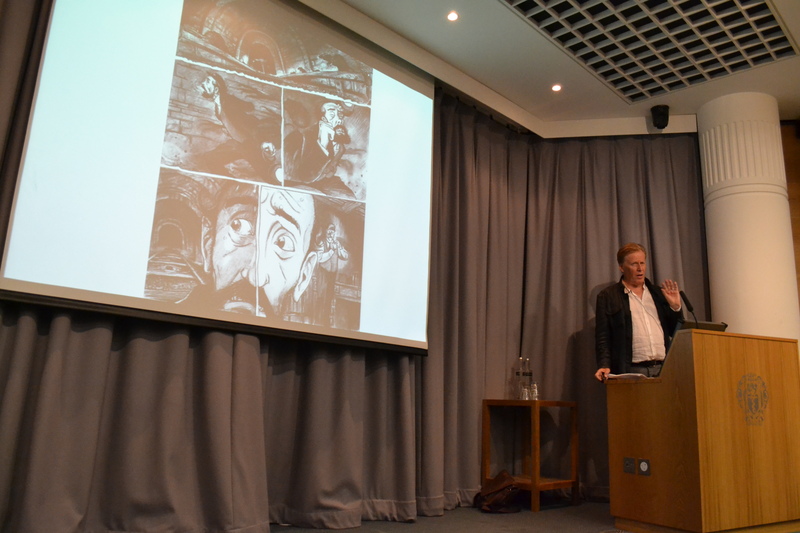 I did a most enjoyable talk for SelfMadeHero for their Guardian Masterclass last Saturday on how to write a graphic novel. Thought it would be useful to share some of my key points for those who couldn’t make it to London, and have ambitions in that direction. I based my talk around a new project I’ve only been working on for the last six weeks. It’s a WW1 series in the tradition of Charley’s War but with a number of significant differences. It started off as Fred’s War but is widening by the day into a group story. I’m very lucky to have the artist David Hitchcock on board, who has a superb Edwardian/gothic-y style with tonnes of atmosphere. Market? Mainstream, Fan, Superhero, Comic Lit or other? This is clearly Mainstream and most of you will know that’s where my heart is. Unique Selling Point? 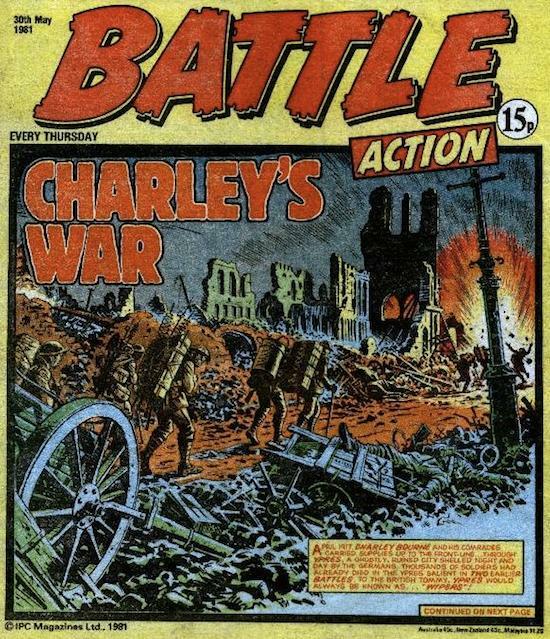 World War One because of anniversary and because there’s a lot happening with Charley’s War during the anniversary years. Six years ago, it wouldn’t have flown. See Hislop’s Wipers Times where he said the same thing. He tried six years ago with it and couldn’t get any interest. Test the water. Hence the summary image which shows key elements of the story. That went down well and attracted a lot of interest, so it’s encouraged me to go much further. Bible. Use a bible. I use Robert McKee, who wrote Story. I’ve attended one of his seminars – great value for money. The fact that several people in the business don’t like him is a further recommendation for me. You don’t expect his abrasive style to win him friends. His book is pro-“Classical” (mainstream) and less enthusiastic about Arthouse, so that’s another reason he works for me. McKee has a lot to say on the concept of “positive and negative” values. Worth buying his book for that alone. 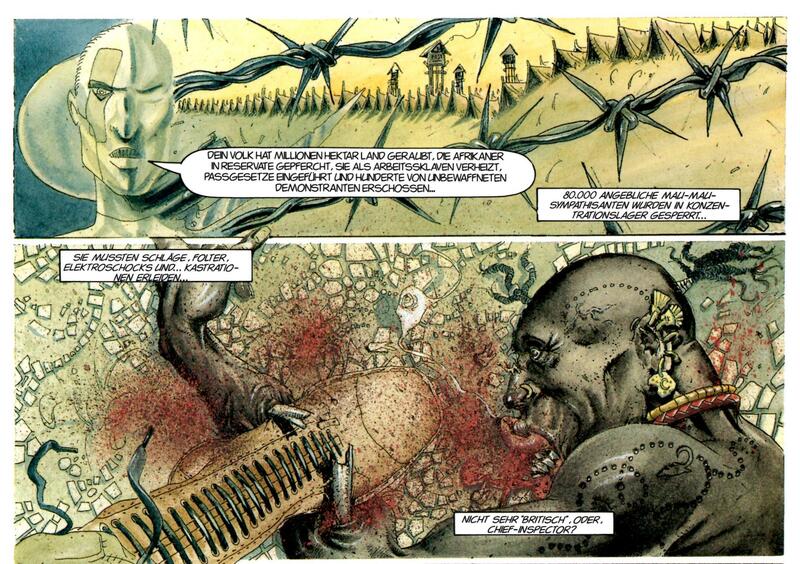 Although it’s about film, the principles for graphic novels are almost identical. Theme. ALL scenes should further the theme. If they don’t, ditch that theme or story strand. I cited an example where I dumped a Home Front scene with Fred’s working class girlfriend, where she falls from grace through drugs (widespread scandal in UK no one talks about even today). Didn’t fit the theme – so, much as I was attached to that scene, out it went! Charley’s War theme is: The ordinary soldiers’ patriotism was betrayed by the ruling class. It’s almost but not quite “World War One was a class war” which would have meant ditching certain stories and adding others. (E.g. Add a scene in 1919 when the tanks arrived in Glasgow). Accident Man theme is: Materialism is almost all you need in life. The “almost” is the problem for Mike Fallon! (Accident Man collection due out in Feb 2014 from Titan). So the theme for my new war story is: The World is my country. 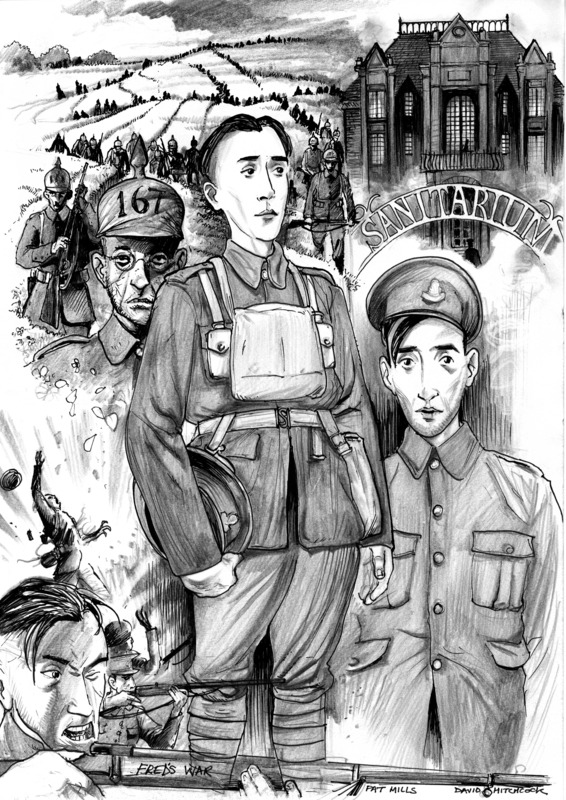 The story started with Fred and his conscientious objector younger brother. That phrase “The World is my country” comes from the Wheeldons*: pacifists who feature heavily in my story. We need more working class heroines like them for this anniversary, otherwise we’ll all be submerged by tales and poetry of middle and upper-class heroes. (Read about Alice’s extraordinary story here). * Edit: Many thanks to Fiona O’Neill for pointing out that the quote is originally from Thomas Paine’s The Rights of Man (1792). Positive and Negative. If a scene starts with a positive value, then it will end with the negative of this value. Or vice versa. If it doesn’t, then it’s probably exposition, according to McKee, and it should be dumped. He’s right. We hide this error in Mainstream because we have so much action it disguises our faults. And sometimes we write this way intuitively. Ditto in Lit. But if you look at Comic Lit, I’ve come across pages which despite being well written and beautifully drawn, were boring. It’s because they do not follow this principle. Being literature or art-house is NO excuse, it’s a cop out. The principles go back to Aristotle. 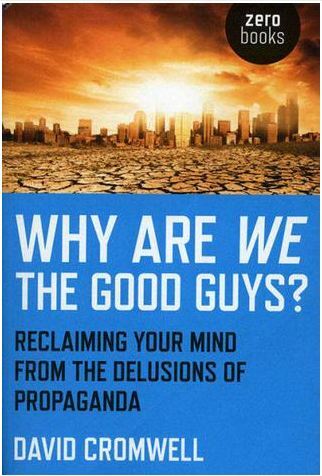 McKee has much to say on this and it’s all excellent. Edit your script after it’s drawn. Some artists won’t let you do this and if they’re top names you have to put with it. And it may not be necessary if they’ve got a big following But if you can it a) acts as an extra draft b) tailors the words to the art. c) If artists are poor storytellers, you can hide it with good editing. d) If their art is empty or even rushed, you can disguise this with extra words. e) If when you wrote it you were having a bad day you get another chance. f) If your dialogue is too heavy or light you can shift it around, so it doesn’t mess up the art. This technique is rarely applied today, by writer or editor, partly – and understandably –because of economics, but it was STANDARD practice when I started. Standard practice for a reason – it worked. (Excepting of course editors who don’t know what they’re doing and made changes, e.g., in Charley’s War, Charley’s working class catchphrase: “Alf a Mo” regularly got altered by the editor to “Half a Moment”. FFS! I have to say, I enjoyed my first tutorial in a helluva long time. There’s something in this teaching business. Hope it was useful to you, too. 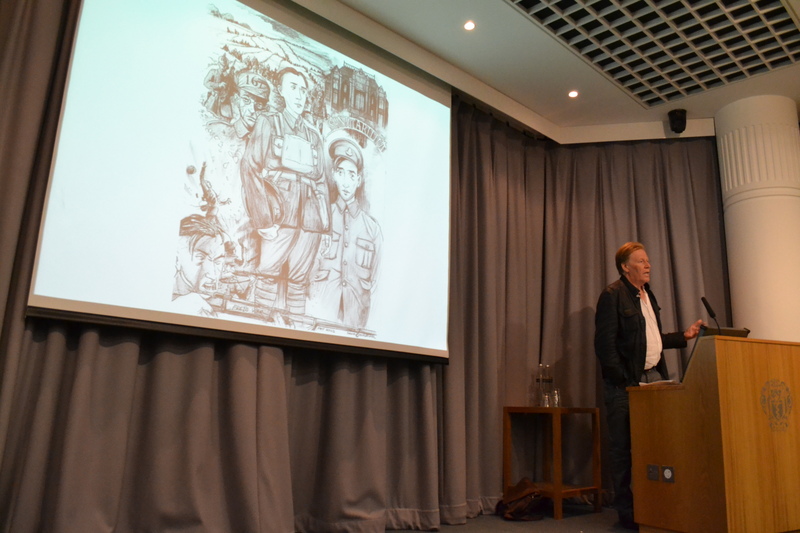 First unveiling of David Hitchcock’s Fred’s War character study to the public. One of David’s previous projects: the wonderfully creepy The Signalman. 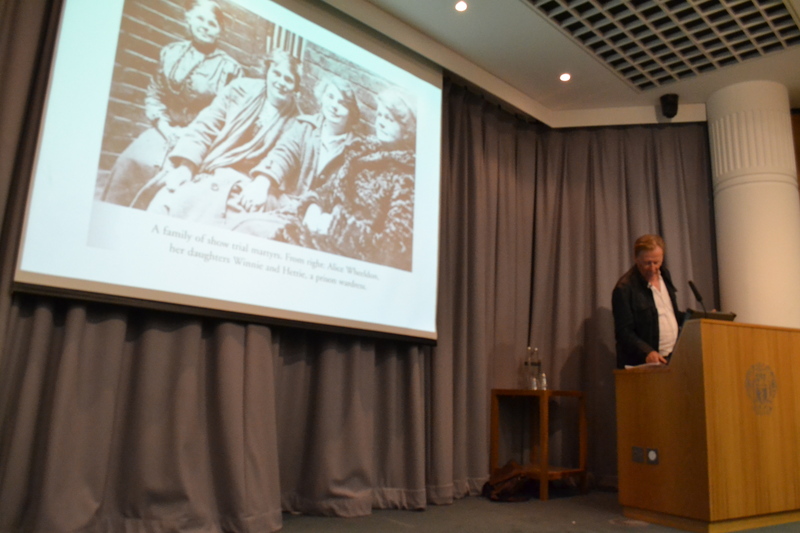 Inspiration for my theme ‘The World is my country’: The Wheeldons, whose efforts saved countless lives during WW1. 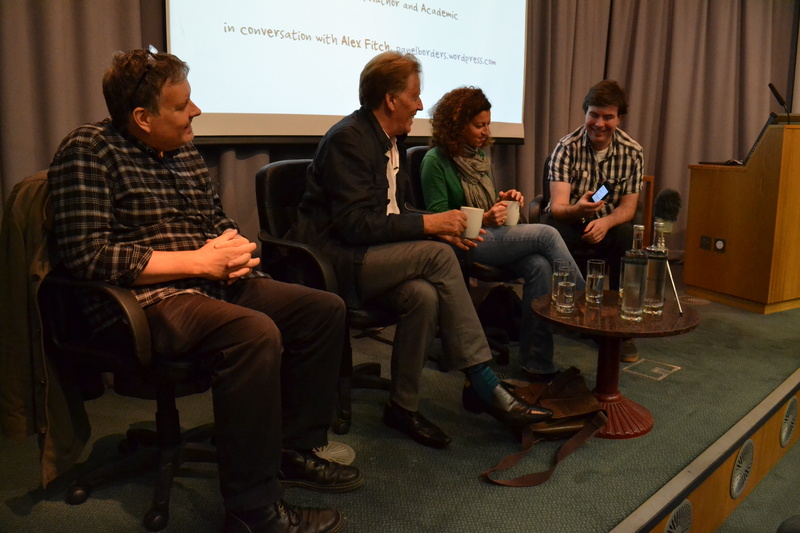 I was invited to take part in a panel after the talks with Roger Sabin, academic and author, and Emma Hayley, Managing Director of SelfMadeHero. 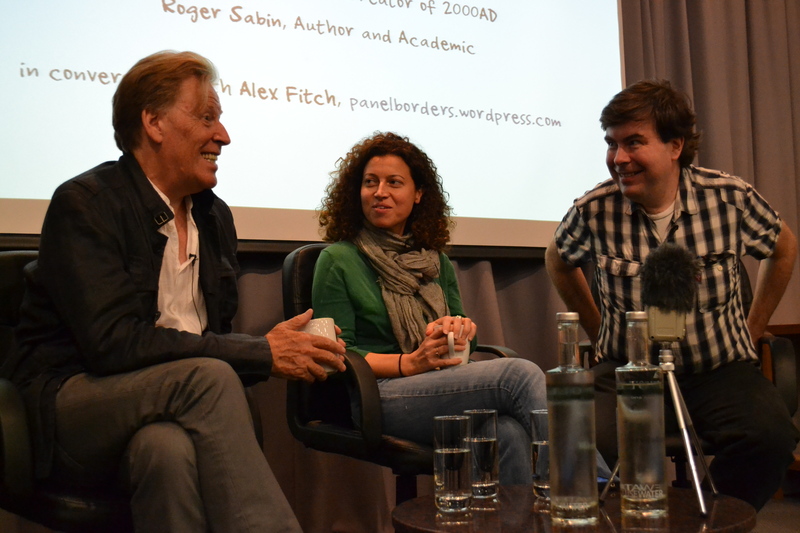 Chaired by Alex Fitch, Panelborders. Gathering for a group shot of the last remaining stragglers. 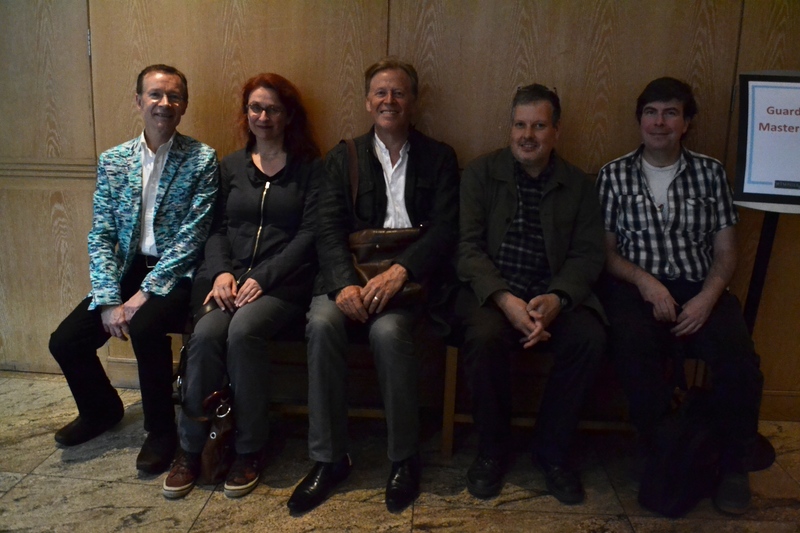 Deeply admiring of Paul Gravett’s snazzy jacket. 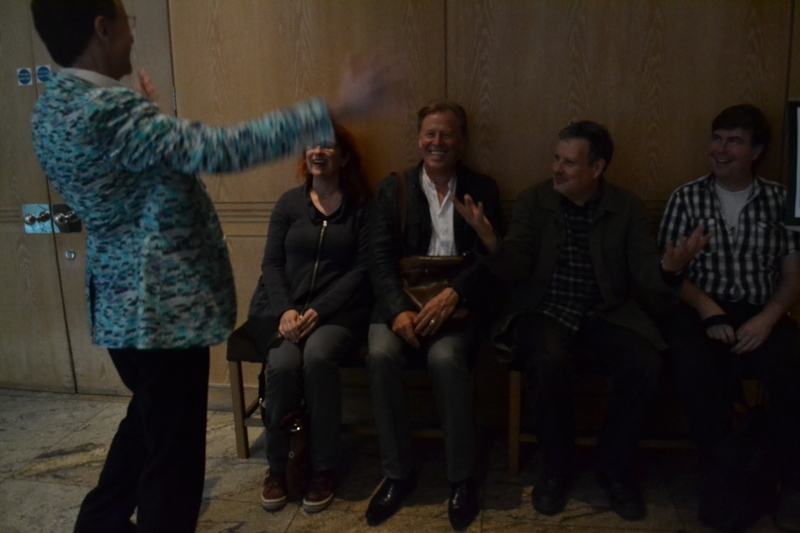 Paul Gravett, Audrey Niffenegger, Pat Mills, Roger Sabin, Alex Fitch. And we manage to squeeze illustrator JAKe in, too. 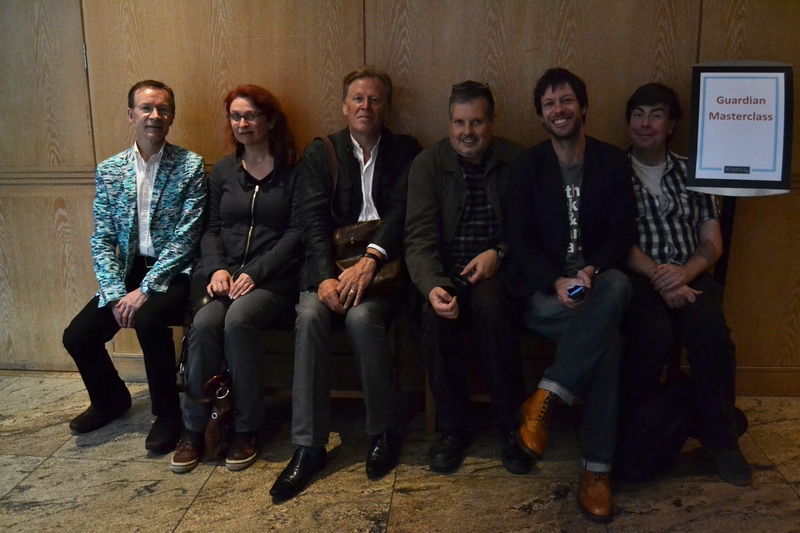 Big thanks to SelfMadeHero and the Guardian Masterclass teams who invited me along, and made it all happen! 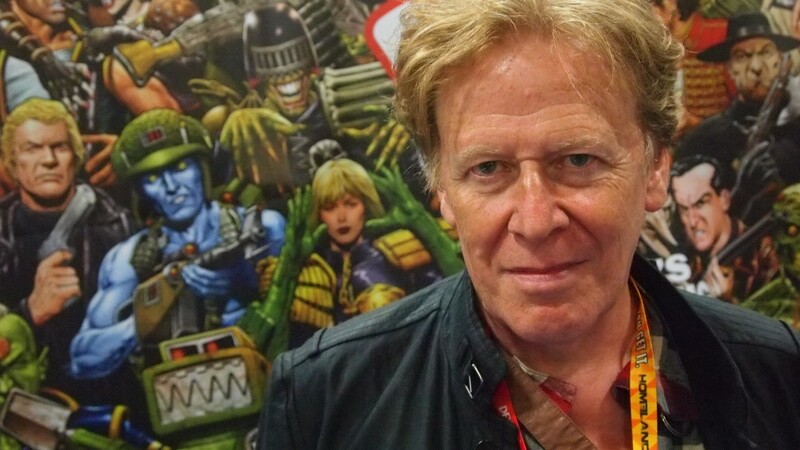 Here’s a great piece on The Best of Battle (Titan Books) and Charley’s War, including an interview with me, by Steve Earles for thequietus.com. I must do a quick plug for David Cromwell’s excellent analysis of the ‘free press’ of the Western world. It’s a riveting read, and very well researched. Here are a couple of my favourite quotes. 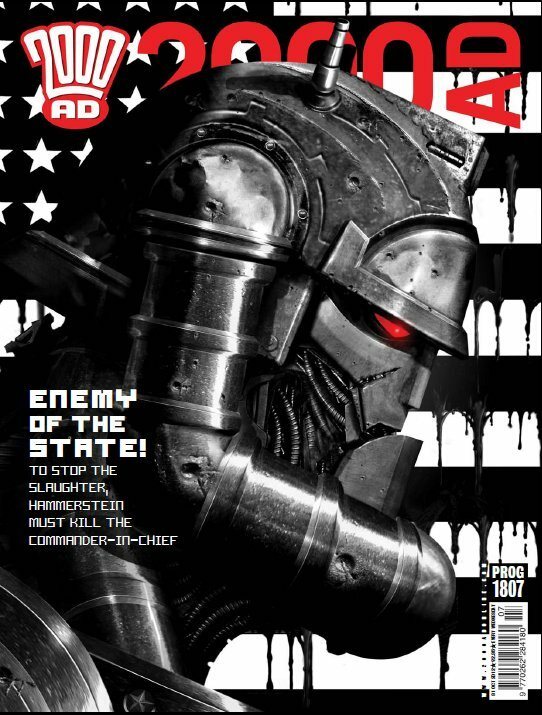 Great cover by Clint on the latest 2000AD. And my favorite episode of “Return to Earth” follows shortly thereafter, which shows the United Kingdom in a less than flattering light. If the idea of Britain as the bad guys seems a bit strange, it’s largely down to how unfamiliar that is in the pages of popular fiction, because they are generally written by conservative writers. Although in the pages of fact things are finally starting to change, even if they still have a long way to go. Actually, I think it’s patriotic to finally recognize that Britain is no different to any other country and is not morally superior – which is certainly what I was taught at school. Or rather lied to at school. I can remember being told how evil the Mau Mau freedom fighters in Kenya were. Ditto freedom fighters in Aden, Malaya and Cyprus. Anyone who challenges Britain and stop it stealing their wealth must – by definition – be evil. No wonder the UK was known in other countries as Perfidious Albion. We have carefully whitewashed over the darkness of our appalling history and we still today have jingoistic reporting of Prince Harry, after his recent shenanigans, as an intrepid hero in Afghanistan – “Prince vows to fight on after deadly gun battle” – which is nothing short of an old school, Imperialist Ripping Yarn designed to boost army recruitment, along with the Action Man toys owned by the MOD. I don’t know about his current tour, but an army officer told me the Prince was very well protected on his previous heroic tour. So nothing’s really changed from the days of Kipling, Henty and all the other justifiers of Empire. We still have the White Man’s Burden which I satirised – with co-writer Alan Mitchell – in Black Man’s Burden in Crisis. 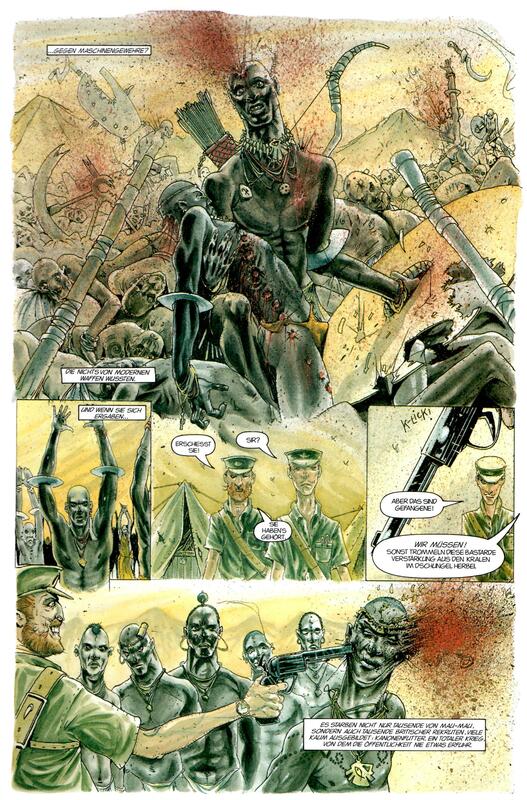 Powerfully illustrated by the late John Hicklenton, it showed the other side of the Tarzan coin with images from the British massacres of the Kenyans during the Mau Mau rebellion. The printers were so appalled, they tried to stop it being published. Britain just doesn’t do things like that. Or rather, it rarely gets found out. This is a foreign edition, I’m afraid as – to date – it has never been reprinted by a British publisher, although I live in hope. So look out for an upcoming episode of the ABC Warriors where a British Prime Minister (Old Etonian and Bullingdon Boy) and the descendant of a Mau Mau leader fight to the death in a globally televised Rollerball-style Tournaphon. They have both trained for months for a series of pentathlon-style contests, which viewers phone in and vote for, concluding with a single combat event. War has just been banned by the United Nations so this is the way conflicts between leaders are resolved in the future. Imagine such a scenario in real life and who might win. Blair versus Saddam Hussein. Bush versus Bin Laden. Obama versus Assad Ahmadinejad versus Netanyahu. Cameron versus Gaddafi. Single combat is less absurd than mass-slaughter. Why should squaddies be sent to do their dirty work? How heroic would our leaders be if they had to do the fighting themselves? I think they’d try a whole lot harder for peace if their own lives were on the line.The fact that it seems bizarre, ridiculous and science fiction to us, is a measure of how brainwashed we are to the logic and inevitability of war. Yet surprisingly General Smedley Butler, America’s most decorated soldier, once talked in not dissimilar terms. He suggested that the only people who should vote for war should be those who would be called upon to do the fighting and the dying. “Only those who would be called upon to risk their lives for their country should have the privilege of voting to determine whether the nation should go to war.” How ridiculous. Surely Blair and Bush and Obama’s way is superior? The fact we don’t hear much today about Butler – who stopped an attempt by American corporations to stage a fascist coup in the US – is a measure of his importance and the inconvenient truths he related about war and the arms industry. Do check out the Tournaphon – it’s a great catharsis!